Last edited by Ironman8; 01-18-2015 at 03:57 PM..
8. 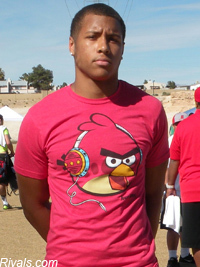 Alize Jones, TE, Las Vegas (Nev.) Bishop Gorman (Class of 2015) – As a rising junior at the Georgia Nike Camp in the spring of 2011, O.J. Howard had an eerily similar combination of size and athleticism as that of what Jones showed on Sunday. Over the next two years, Howard became one of the nation’s most highly-recruited tight ends and ultimately signed with Alabama. I’m predicting a similar fate for Jones with regard to his recruitment. At 6-4, 215 pounds, he’s extremely well-constructed and showed outstanding athleticism and ball skills. Remember the name. BG will keep pumping out D1 talent for a long time. They are a private school in Vegas and offer full rides to the best talent in town. I'm seriously beginning to hate UCLA.